IWAKI Nordic offers as a supplement to our IWAKI pumps WALCHEM process controllers for pH, redox and conductivity, as well as special controllers for copper and nickel surface plating. WALCHEM is a part of IWAKI America Inc.
WALCHEM produces a series of advanced microprocessor controllers. Based on measurement and recording of process values, these controllers enable you to feed chemicals and thereby to regulate the actual process. The available controllers features controller solutions for the following applications: Cooling Tower, Boiler, Disinfection, pH/ORP, Electrodeless Conductivity, Contacting Conductivity and Plating. Go to the Controller Selection Chart. 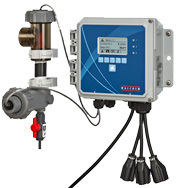 The W600 series provides reliable, flexible and powerful control for your water treatment program. The W600 Series controllers feature a large touchscreen display with icon based programming to make setup easy. Universal sensor input provides extraordinary flexibility; the same controller can be used with almost any type of sensor needed. Six control outputs allow the controller to be used in more applications. The W600 controllers also offer Datalogging option and Ethernet option for remote access via the Internet or LAN. The metal sensor input card for the WCU/WNI600 controller allows the use of either a copper or nickel sensor along with a pH electrode. 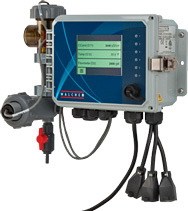 Connect with the Walchem W900 Series controllers and enjoy unparalleled versatility in maintaining your water treatment operations. The W900 can be configured with easy programming on the large touchscreen or online using a standard browser. Plus universal sensor inputs enable excellent flexibility to utilize many sensor types, including pH/ORP, conductivity, disinfection, flourescence and flow meter input. 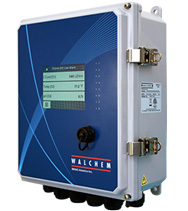 The Walchem controllers are designed for many different tasks. Use the selection chart to find the most suitable controller for your application.